The fine art of TIG welding results in some of the most intricate welds if executed to perfection. However, for achieving your core aim, you need to be backed with a solid TIG welding machine as well as adequate skill and patience. Tungsten Inert Gas welding can result in super strong and neat structural welds which do not tag along the requirement of further cleaning given the minimal spark and spatter produced during the job. For benefitting from the perfect heat level, arc balance and amperage which can help constitute durable welds for commercial usage, it is imperative to pair up with a powerful and technically advanced TIG welder. The versatility of the machine varies proportionately with the amperage range. Thus, you can weld almost everything with a machine having an output range of 5-230. Good machines also need to showcase utmost stability at low amperage for gaining greater control over the arc which tends to get bouncy at low amperage. Thus, it is natural to feel tempted to hike up the amperage for gaining steadiness. It is also essential to remember that higher amperages can burn right through the thin pieces of metal. Aluminium requires a higher amperage compared to steel making it mandatory for all associated welders to sport an amperage exceeding 200 amps. Usage of AC current becomes essential while working with aluminium whereas steel welding creates the necessity of DC capability. AC current aids the welder in cleaning up the oxidation while welding simultaneously. It is also essential to establish the right balance over AC controls by either shortening or lengthening the welding and cleaning cycles. Having an in-built heat control feature will help in keeping things cool and safe during the otherwise hot process of welding. Thin metals have a tendency of getting warped in high temperatures. The built in pulser in best TIG welders ensures alternate flow of high and low currents for helping the welder maintain its arc without crossing the heat limit. Most of the TIG welders either come loaded with foot pedals or provide the option of attaching one. These easy to use features can help in enhancing the user’s concentration level by keeping both his hands free and delivering greater control over the weld. 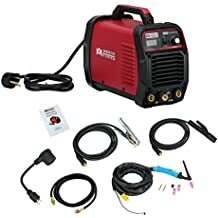 Decent TIG welders can work at ease with the dual power inputs of 110V and 240V. This also accentuates the flexibility of the machine making it possible in being used almost everywhere. 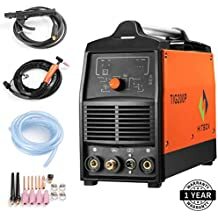 Enough said, let’s now take a look at the best TIG welders under 500 dollars of 2018 available in the market to help you out with the welding functionalities. 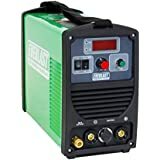 If you are on the lookout for a welder which can provide you with the unique combination of brilliant arc stability and advanced IGBT inverter technology, then your search is bound to come to an end once you come across the Amico TIG-225 welder. The strong and durable components of this welder make it the ideal choice for undertaking heavy-duty usage. Adequate protection is rendered from over and under voltage fluctuation so that you can stay abreast of all chances of accidents. It also offers the flexibility of being hooked up to both 115 and 230 volt outlets thus adding to its versatility. The presence of automatic temperature control and steeples amperage controls makes it ideal for being used with various types of generators. You can easily gauge the operational metrics by taking a look at its vibrant LCD amperage display while a start-up stands guaranteed at 100% coupled with the high frequency service. The strength and lightness of its components make it ideal for being used both by hobbyists as well as professionals. IGBT inverter technology helps in seamless switching from TIG to ARC and Stick welding. Great arc stability ushers in optimum precision in welding thin pieces. Offers automatic compensation for over and under voltage fluctuation. Splatter as well as post-weld clean up becomes almost non-existent by the delivery of flawless weld time and again. Might seem to be a bit harder to operate that its peers. This high-grade welder can easily outperform its peers when it comes to voltage control, arc quality, price and duty cycle. With its operational prowess, which can easily weld up to ½ inch of alloy steel, stainless steel, mild steel, chrome and copper, the Amico welder sums up as a flawless device which can make post-weld clean up and splatter almost non-existent. Weighing at just 25 pounds, this portable welder comes with a year’s warranty to deliver peace of mind to its users. The best feature about this dynamic welder is that customers can even weld thin steel by adjusting the Amp to lower settings. The Amico 200 is perfect for welders who are beginning their venture with a specified budget and are not much confident about the future course of action. Users can exercise better control over the heating feature without having to blow all the way through the material making this TIG welder a perfect option for welding thinner and smaller products such as kitchen sinks, tool boxes and kitchen appliances. Portable design perfect for being used around the house. Machine remains solid even after continuous usage. Dual voltage input helps in plugging the device with all common power sources available. Users cannot make use of flux core wire. Mismatch between the LCD readings and amperage adjustment knob scale. 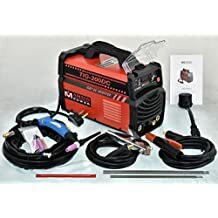 You can now make the most out of high-quality welding coupled with the TIG200P welder by Hitbox which can run on generators with more than 5000 watts of power. Its inverter technology makes the usage of a transformer almost redundant while adding to its portability for mobile welding. The low power consumption also leads to massive savings in energy which in turn paves the path for an eco-friendly operation. However, it is imperative to note here that this DC welder cannot deal with aluminium which requires AC high frequency for such operations. Longer leads might cause you to lose voltage making it necessary to use a drop cord and regulate the settings to a higher node thereafter. No control can be exercised by the TIG torch for adjusting the welding amp. It is advisable to separately purchase a TIG torch for adjusting amperage levels. Its digital ammeters make it easy to keep a tab on various settings while the pulsed-high performance caters to ultra-thin surfaces without any deformation. The TIG welder does not create a ruckus even while keeping itself cool with adequate protection against over-voltage, under-voltage, over-current and heat emitted. Pretty accurate in regards to the amperage. Has a super smooth arc which initiates its action easily. Ranks high in terms of customer service. The manufacturer offers 1 year warranty on the product and free lifetime technical support. Features high frequency start and duty cycle of 60%. Does not have a foot pedal option. The PowerARC from EVERLAST can serve as the perfect pick for novice welders with its easy learning curve. In comparison to its peers, the 2017 model produces a much higher OCV. You also won’t have to dial as much current as that of other stick welders. It also becomes easier to adjust the current within one or two amps while enjoying a plush output control. While this machine can be used both on 110 and 220 volts, you can make use of the accompanying adapter for converting any 50A 240VAC plug to 110VAC outlet. So, if you are on the lookout for a device which can assist you in stick welding as well as TIG without having to spend a fortune, then the EVERLAST PowerARC can serve as your ideal choice. The welder comes neatly packed and is bound to stun you with its compact shape which can be moved around easily even when you are working in an area having constricted floor space. Torch is comfortable to use. Comes with all the necessary accessories for getting started almost immediately. Supports dual voltage levels of 110 and 220 volts. There was a time not long back ago when TIG welding was meant only for a selected few due to its exorbitant price. But innovative designs have brought down the price of TIG welders while adding to its efficiency at the same time. 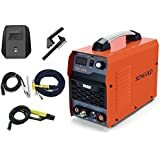 The SUNGOLDPOWER TIG welder stands out as a pioneer of this affordable bunch as it packs in upgraded features and technology which was till now earmarked only for the expensive models. You can take the example of HF Start, on-board fan, ability to compensate voltage fluctuations during normal operations and numerous on-board system protections which were the characteristic attributes of premium models. Weighing at just 22 pounds, the compact and lightweight welder from SUNGOLDPOWER can best serve welders who are always on the move. You can also keep a tab on the voltage AMP coupled with the digital readout of the LED display. Overheating gets minimized by the on-board fan which protects the vital parts from getting heated excessively. You can also be guaranteed of a start-up at 100% courtesy the HF service as you take on MMA and DC TIG welding with this robust welder. Tungsten life also gets improved by an HF start-easy arc as you take on an array of metals such as nickel alloys, stainless steel, steel, brass, copper and bronze. Inexpensive model which is perfect for DIY beginners. Perfect for MMA and DC TIG welding at higher frequency. On-board fan helps in keeping the device cool thus extending its longevity. Voltage fluctuation gets compensated automatically. Cannot be used on conventional 110V current. Does not support AC and is too basic for professionals. Beyond all word of mouth referrals, between-the-line analysis and market survey, the one thing which will help you most in bringing home the best TIG welder is your intuition. Thus, if a product does not appeal much to you in spite of its online grandeur and glorification, you should skip it unapologetically. Certain advanced TIG welders offer astounding flexibility when it comes to choosing the specimen from sensitive alloys to thick steel sheets. However, braced with a reliable TIG welder, even the toughest of welding assignments are bound to feel like child’s play. After going through our discussion, you are bound to have accumulated extensive product knowledge which will help you in generating unbridled return out of the investment made. So, assess your exclusive welding requirements first and thereafter proceed with the final selection accordingly.